I am a crafty girl who came from a crafty home. Growing up, my mom taught me any craft I wanted to learn: cross-stitch, embroidery, needlepoint, sewing. Even as an adult when I needed to know how to crochet for work, I turned to my mom to teach me the basics. Somehow, she knew all these crafts and was happy to teach me. My mom is also my crafty inspiration. I truly admire her creativity, her sense of artistic adventure, her use of color. A trip home simply isn’t complete until she shows me her latest projects and tells me her ideas for the next ones. I was home again just last week, and I asked Mom if I could share some of her creations with you. 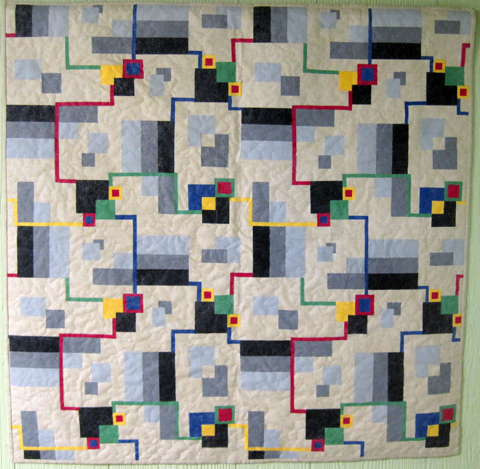 She agreed, so now, I share with you some of the amazing quilts by my mom, Rose Doyle. 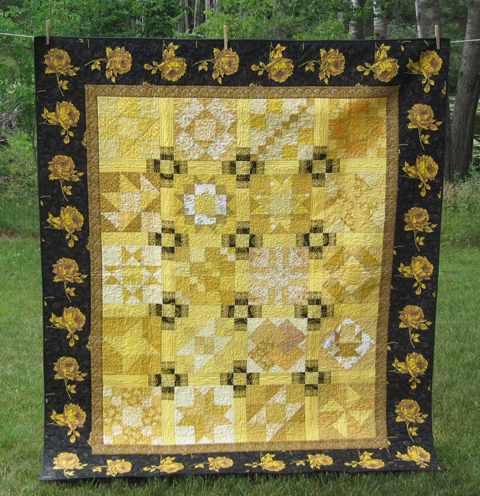 While she knows a wide variety of crafts, Mom has considered herself a quilter since 1980. Since then she’s made approximately 100 quilts of varying sizes. She’s won ribbons for many and has even judged a few quilt shows herself. 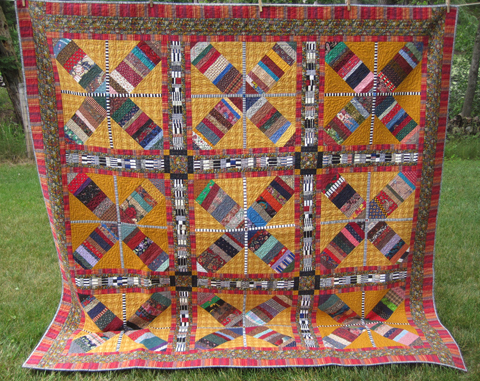 The quilt above is one of her favorites, titled Hutchison County Crossroads (made in 2006). 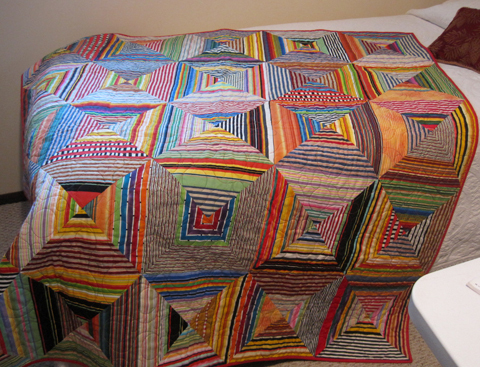 Striped fabrics often find their way into her quilts (see the latest one at the top of this post), but in Hutchison County Crossroads, she made her own stripes using scrap fabrics cut into varying widths. Below is the back of this quilt. Black and white fabrics have also been inspiration for Mom in recent years. In this one, titled Wild Hair (2010), she used the blacks and whites to set off the colorful blocks filled with florals and wild prints. 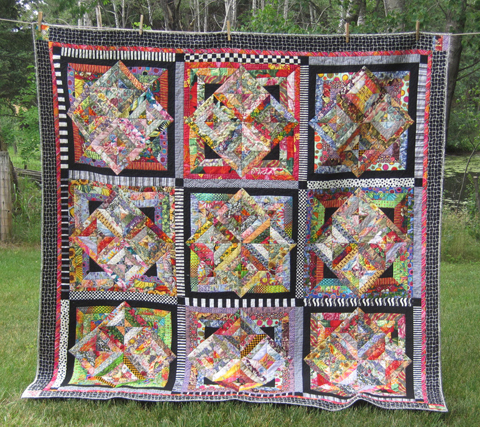 Given the size of her stash and the number of quilts she’s made, it’s not too surprising that scrappy quilts are some of her favorites to make. 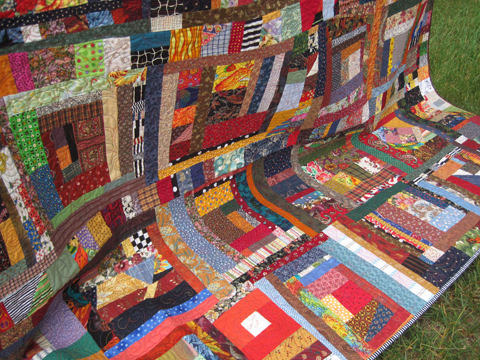 This one, titled Totally Scraps (2009), was inspired by the quilts of Gees Bend. One of my personal favorites is this monochromatic sampler made in 2003. When I first looked at the quilt, I didn’t even see it was a sampler quilt. (Aren’t those supposed to be kind of boring?) But here, her use of color and the fabulous vintage fabric that makes the border, give these traditional quilt blocks new life. I love that anything can inspire Mom to start thinking of a possible new quilt design. During one of my first trips to the Cincinnati zoo, the family was ready to move on after visiting the reptile house, but Mom was nowhere in sight. No fan of reptiles, she still couldn’t help but take a few minutes to sketch the pattern on a python for possible use somewhere down the line. One of Mom’s most challenging projects was inspired by the linoleum design on the kitchen floor in her family’s farmhouse. She decided to create a wall hanging that replicated that design at full size, using the exact colors of the flooring. She did finish it though, fusing the pieces in place, and placing fusible webbing over the top to keep the pieces from peeling up. A bit of quilting and the binding were all the sewing she did. Just recently, Mom did a trunk show for her quilt guild. There she found out that one active member remembered going to a guild workshop day to see if this was a guild she wanted to join. There she saw Mom working on the linoleum quilt, and the woman decided to join the group. It seemed like these people had some interesting things going on. Not everyone in her guild “gets” Mom’s quilts. Bright colors, wild prints, crazy designs. I attended one of her guild meetings a few years ago, and brought my t-shirt quilt to show. 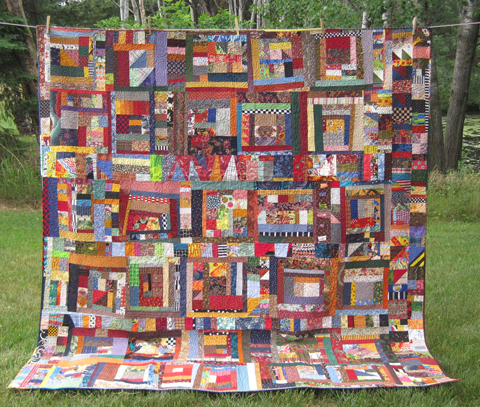 One woman, who was familiar with another quilt of mine said, “Those colors. Again?” She didn’t care for my style, and I felt like my mother’s daughter. I couldn’t have been more proud. Over the years, my mom’s style has changed. 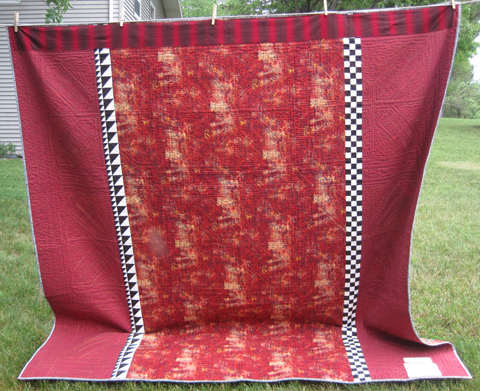 She started out making darker, more traditional quilts, with more definite patterns. Now she uses brighter colors and tries to be a little more creative. “I’m still not where I want to be,” she said, “I’m not sure I’ll get there.” But I know I, for one, will enjoy, admire, and be inspired by her artistic journey, wherever it leads. Recently my good friend and former co-worker Tonia Jenny (until her recent marriage she was Tonia Davenport) asked me to participate in the Week as Art portion of CreateMixedMedia.com. Each week a different artist creates the numbers for that week, Sunday through Saturday. And since it’s a mixed media blog, any type of art goes. 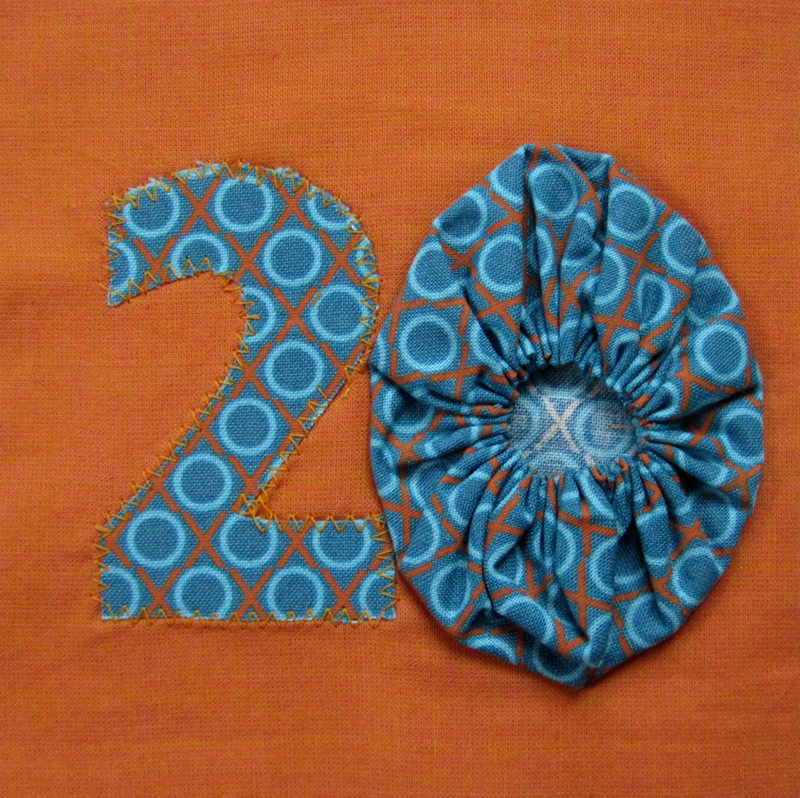 My most recent crafting kick has been sewing, so for my numbers I decided to test some of my sewing skills. And put to the test they were. On the site, each piece of art is tiny (only 89 pixels square), so making the number itself the focus is important. Applique seemed like the logical choice for most of my pieces. Here I tried my hand at needle turn applique. The sharp corners of the numbers were tough, and you can see some of my rough edges here. 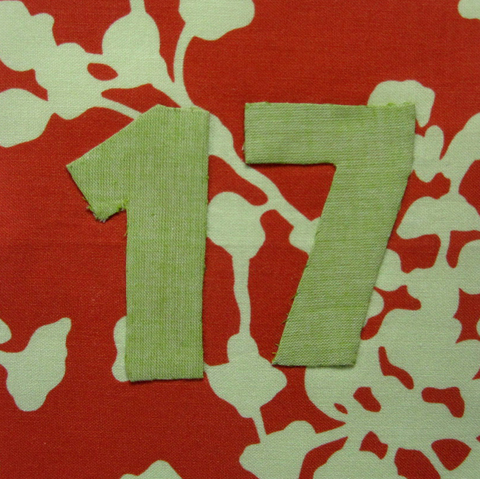 I cut the numbers out of freezer paper first, ironed them to the back of the green fabric and cut around the paper leaving about 1/4″ seam allowance. As I folded the seam allowance under and stitched it down by hand, I used the freezer paper edges as a guide to keep the number’s shape. 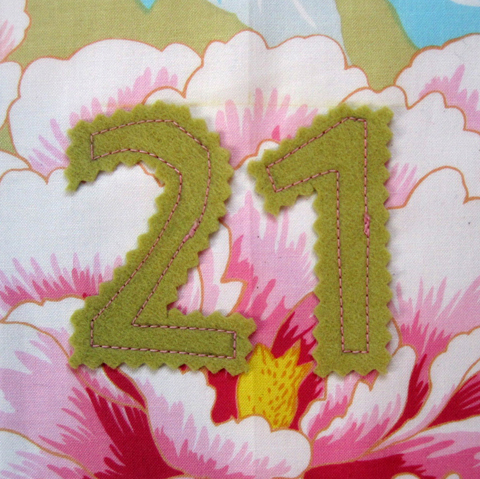 I used good old-fashioned hand embroidery next, outlining the number shapes with a back stitch. 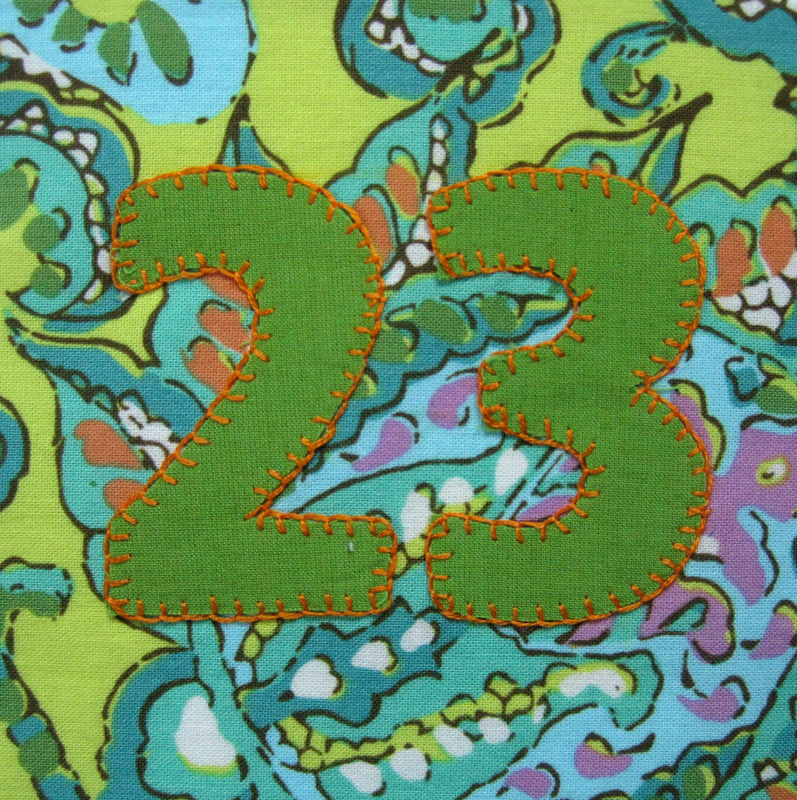 The numbers ended up a bit off center, so I added the rickrack to fill in the space. 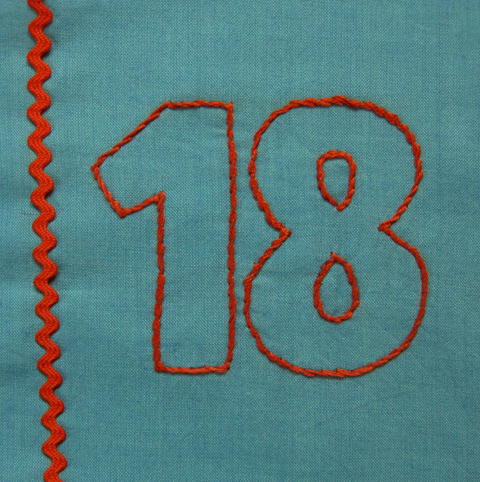 Raw edge applique is the technique I used for the number 19. I fused interfacing to the dark pink fabric and cut the number shapes from that. 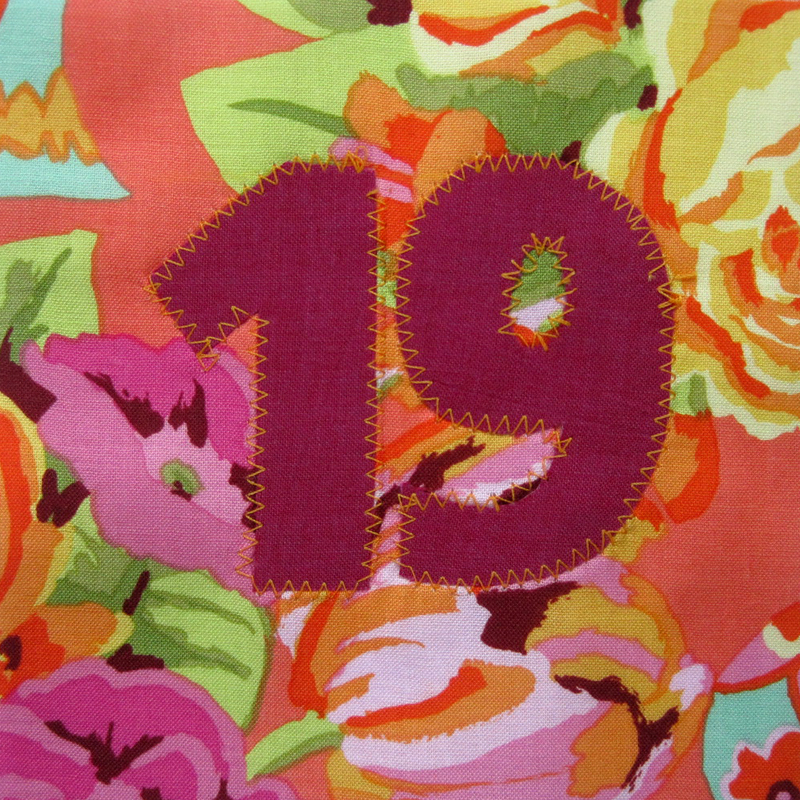 I used a zigzag stitch on my sewing machine to secure the numbers onto the background fabric. Here I added a little felt to the mix. I love the look of pinked edges on felt pieces, so I cut the number shapes with my pinking shears and stitched them down with my sewing machine. The pink thread helped the numbers to stand out a bit, too. I wanted to include some reverse applique even though I’d tried the technique only once before. 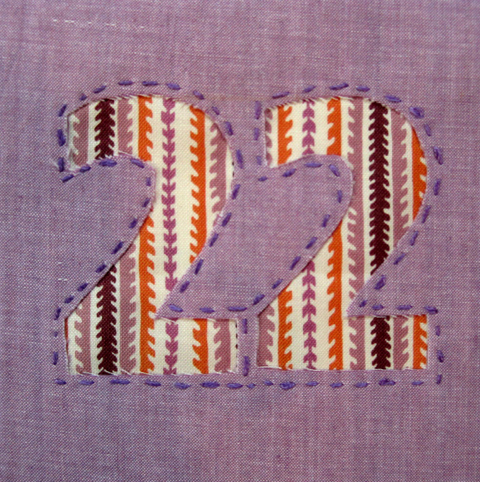 I fused interfacing to the back of the purple fabric to make the number shapes easier to cut out. I cut the striped fabric to slightly smaller than the purple square, basted the striped fabric in place, and then stitched with embroidery floss around the number edges. Here, for my seventh and final number, I did another raw edge applique, but this time, instead of sewing the edges on my machine, I hand stitched them with a blanket stitch and two strands of embroidery floss. I was a bit concerned the green wouldn’t pop off the patterned background, but I think the orange outline adds just enough contrast. Tonia is always looking for new artists to feature on the CreateMixedMedia.com site and in the Week as Art segment. If you’re interested in applying to participate the Week as Art, click this link for the details. Usually putting together a jigsaw puzzle is more of a winter activity, but this weekend (and on through Tuesday), my husband and I put together the best puzzle ever. We’re both fans of the artist Charley Harper, so we always check out the selection of his licensed products whenever we’re at the Cincinnati Nature Center. (Harper was a long-time Cincinnatian who created work for the Nature Center, and they have an art show of his work there each December.) This past Saturday we saw that several new puzzles had been added—yay! We chose The Coral Reef puzzle for a few different reasons. It’s colorful. It’s a topic we’re familiar with (my husband scuba dives; we both snorkel). And, besides the yellow area, it didn’t look too hard. As soon as we started turning over the pieces and separating the edges, I knew I was in love. How could you not get excited about pieces that look like this? 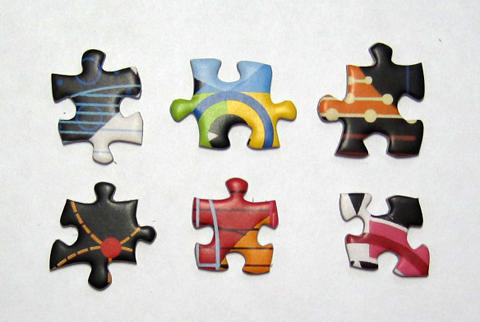 Heck, I could design a half dozen quilts around these puzzle pieces! And the puzzle was just fun to do. The fish are charming; it was fun to run into the pieces for one that I hadn’t noticed when looking at the picture on the box. And it us kept entertained right through the end. We found that even those pesky yellow pieces had enough on them to be challenging but do-able. 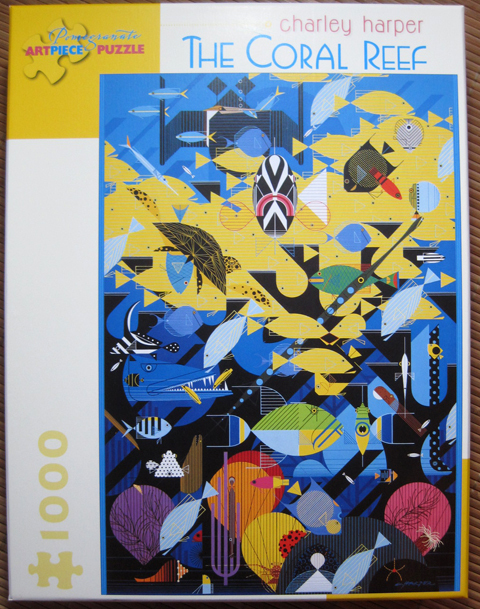 So if you are ever looking for a new puzzle, know this one has our seal of approval. We’ll be stopping by the gift shop the next time we’re at the Cincinnati Nature Center, and I’m sure we’ll pick up a new one. I’ll let you know how it goes.